Medicare is the federal insurance program for people who are over the age of 65, consisting of hospital insurance (Medicare Part A), medical insurance (Medicare Part B), prescription drug coverage (Medicare Part D), and Medicare Advantage Plans (Medicare Part C). Beginning April 1, 2018, The Centers for Medicare and Medicaid Services (CMS)will be issuing new Medicare cards to its beneficiaries. 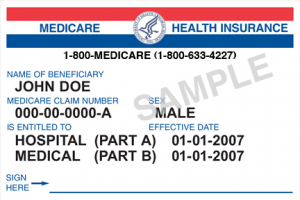 Here are five things to keep in mind with the new Medicare cards. Medicare will mail new cards between April 2018 and April 2019. To help prevent identity theft, the new cards will not include social security numbers. Instead, each person will get a new unique Medicare number. You will not need to do anything to get a card, but you should make sure your mailing address is up to date. This can be done by contacting the Social Security Administration online or at 1-800-772-1213. Once you get your new Medicare card, destroy your old Medicare card and start using the new card. Watch out for scams! As a reminder, Medicare will never call to ask for personal information. If someone calls claiming to be from Medicare, do not share your Medicare number or any other personal information.